Chronosphere was formed in Athens back in 2009, by Spyros Lafias (Vocals/Guitar) and Kostas Spades (Bass/Backing Vocals) & members. They started off as an old-school thrash metal band, but later on they changed their musical direction. These days, Chronosphere consist of Spyros Lafias (Vocals/Guitar), Kostas Spades (Bass/Backing Vocals),Thanos Krommidas (Drums), Panos Tsampras (Guitar/Backing Vocals) and they are delivering new wave of thrash metal. The band counts one demo release (Hypnosis, recorded at Made In Hell Studios in 2010), participation in Manifesto Music Movement’s compilations with one track in each release (Vol.1 & Vol.2, 2010 & 2011 respectively), and of course the debut album (Envirusment, recorded at Esoteron Studios in 2011 / released by Athens Thrash Attack + Eat Metal records). All of the releases above, were supported by numerous shows, appearances in festivals, a tour in Greece, sharing the stage with some of the most well known Greek bands including worldwide known legends Rotting Christ and Suicidal Angels along with UK thrashers Evile.The icing on the cake in the band’s career so far, apart from their appearance at Metaldays festival, is their performance at Wacken Open Air 2013 festival. Worth to mention also the participation on Greek Metal Hammer tribute to Metallica (#348)On 2014, recordings of band’s 2nd full length album were over . 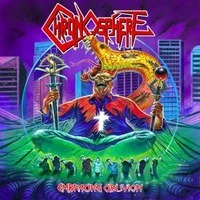 Chronosphere signed a contract with Punishment 18 Records + Spiritual Beast for a European and a Japanese release of “Embracing Oblivion” and it hit the road to unleash its new wave of razor sharp riffs supporting thrash legends Sodom, Destruction and many more!